Digital transformation is affecting how organisations engage with their customers across the entire customer life cycle, from marketing and commerce to products, services, support, and ongoing customer engagement. To ensure you survive and thrive in this digital age, you must know and understand your customers’ unique circumstances. 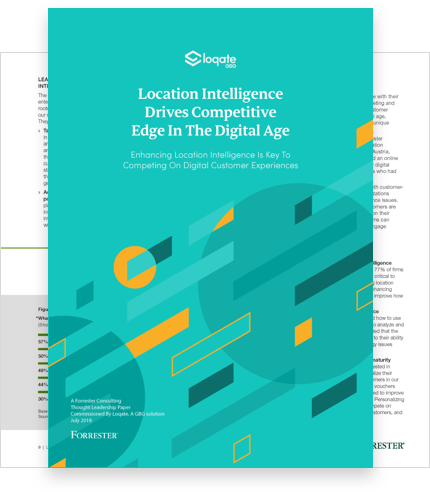 Download the latest study from Forrester to learn how location intelligence is driving a competitive edge in the digital age. Forrester is a leading global research and thought leadership firm who help large enterprise firms with the opportunities and issues presented in today's customer obsessed world. Firms rightly recognise the value added by location intelligence across the customer life cycle. Understand how important location will become to firms over the next three years. Data and technology challenges limit location intelligence effectiveness. Learn why over half of firms surveys reported that poor quality data is one of the biggest inhibitors to improving the experience. The business case for enhancing location intelligence maturity. Discover if consumers are ready for firms to use their location data to personalise the digital journey. Watch this short video with James McCormick, Principal Analyst for Forrester, to learn how and why location intelligence is helping firms to drive a competitive edge in the digital age, and discover consumers' attitudes to how location data can improve their digital experience. Digital transformation is affecting how organisations engage with their customers across the entire customer lifecycle. Watch this short video to learn what your consumers want from you in this digital age. Watch this video to learn how retailers and eService firms can use location data to improve the experience when it comes to the successful delivery of products and services to customers. Good customer data is essential in the highly regulated world of finance. Watch this video to learn how location data can enhance your customers' digital experience. In today's digital age you must know your customer inside out, not only from a regulatory point of view, but also to give them the best possible online experience. Watch this short video to learn how location can help. Hospitality firms have always been 100% focused on ensuring the perfect customer experience, watch this short video to learn how location can help sky rocket your guests' experience in this digital age. Location is the name of the game when it comes to logistics and transportation, however in today's digital age location is playing a vital role in improving business efficiency and customer experience. Watch the video now to learn more. Coordinated, accountable, patient-centered care is reliant on data quality. Watch this short video to learn how location can play a critical role in enhancing your patients' data and experience. Learn the key recommendations from Forrester, and how you can become location intelligent.